The comfort and well-being of our guests is paramount to us. We are a small family business and will personally take care of your needs and requests. The Viglis family has timeless routes in the area as the family originates from the village of Samaria. Artemis Studios are quietly positioned on the outskirts of the village of Agia Roumeli and away from the route into the Samaria gorge. The pretty shingle beach is only 50 meters away. We offer 12 delightful and tastefully decorated large studios of superior standard. 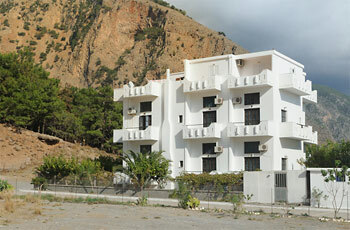 Each studio is suitable for 2-5 persons and has a living-room with an attractive dining corner. 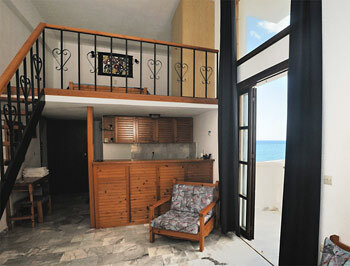 It has a pretty built-in kitchenette with a practical work bench, a shower/WC and one or two balconies. A wooden staircase leads to a sleeping gallery with either one double bed and one single bed or two built-in double beds, depending on the unit. The studios have excellent interiors stylish wood furniture and quality fittings with individual air-conditioning. Each kitchen is equipped with refrigerator, cooking hobs, kettle, frying pan, dishes, glasses and cutlery. We can also cater for groups and have a shaded outdoor space under pine trees located a few minutes walk away where small workshops (yoga for example) could be run. We offer a discount of 10% for stays over 10 days. Children under 2 years are free of charge.